The IPC Gansow CT110 ride on scrubber drier has all the functions of the larger models with the added benefit of being much more compact. Featuring a 110 litre solution tank and a choice of 60,70 or 85cm scrub widths allowing this machine to clean up to 5,525m²/h. For its size the CT110 has great all round visibility allowing the user to negotiate tight gaps and confined spaces. The CT110 has automatic brush pick up and drop off making brush changes easier, automatic squeegee lift in reverse gear and automatic speed reduction in the turns. All these features are just part of the package including a simple to use pre-set control panel allowing the user to clean a variety of floor surfaces. Chemical dosing systems can also be added to the CT110 to save chemical usage and potentially save you money. The CT110 can be fitted with wet acid or gel maintenance free batteries for added piece of mind. 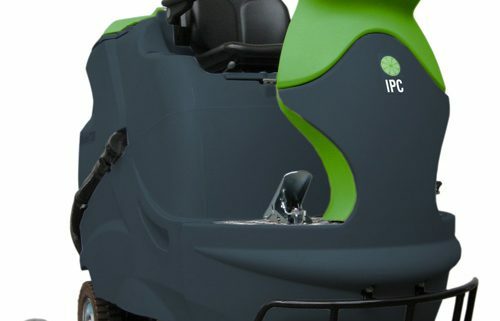 The IPC Gansow CT160 ride on scrubber drier has been designed for large area cleaning. With a 160 litre solution tank and a choice of 70, 85 and 95cm scrubbing widths the CT160 can clean up to 6,175m²/h. Featuring a slim line control panel to give great all round visibility for the user, the CT160 is able to clean in confined spaces and around equipment without causing damage. The CT160 has an easy to use control panel with 3 pre-set clean settings, thus allowing the user to clean a variety of surfaces at the touch of a button. The brush deck features a self-levelling system to ensure maximum brush contact and to adapt to uneven flooring. The benefit of the self-levelling system is a reduced load on the brush motors thus giving increased battery life and reducing the strain on the motors. Brushes and squeegee blades are changed without the use of tools allowing the user to maintain the wear parts. The CT160 operates on a 36v battery supply which can be either wet acid or gel maintenance free batteries. The all new IPC Gansow CT80 ride on scrubber drier is the latest model to enter the range of ECO machines. Packed full of new technologies to reduce water and chemical consumption while increasing the run time on the batteries. The new control panel allows the operator to select a range of pre-set modes or customise to suit the level of dirt at the touch of a button. For uneven floors the CT80 features the SLS (Self-Levelling System) to maintain constant brush pressure at all times and the new auto-fill system includes a Hoselock fitting and auto-stop when full. Operator maintenance has now been made easier with the use of colour coded parts indicating daily and scheduled checks. Parts that need checking have been coded with yellow for quick identification. Brushes and squeegee blades are all removable without tools to aid maintenance and brush fitting is completed from the operator seat at the touch of a button with the Click On/Off. The IPC Gansow CT230 ride on scrubber drier is the largest ride on in the range holding 230 litres for maximum working performance. Available in either 85cm or 105cm scrubbing widths to provide a cleaning productivity of up to 6,825m²/h. The forward visibility from the driving seat is excellent even for such a large machine due to the streamlined control panel allowing for cleaning in tight spaces and around static equipment. The control panel gives the user 3 pre-set work settings from light soiling to heavy dirt allowing the CT230 to work in all conditions. With self-levelling brushes to account for uneven terrain, automatic speed reduction while turning and automatic squeegee lift in reverse to name just a few of the CT230’s main features. The CT230 runs from a 36v battery supply and can be fitted with either wet acid or gel maintenance free batteries.